A filling station is a facility that sells fuel and engine lubricants for motor vehicles. The most common fuels sold in the 2010s are gasoline (gasoline or gas in the U.S. and Canada, generally petrol elsewhere) and diesel fuel. A filling station that sells only electric energy is also known as a charging station, while a typical filling station can also be known as a fueling or gas station (United States and Canada), gasbar (Canada), gasoline stand or SS[Note 1] (Japan), petrol pump or petrol bunk (India), petrol garage, petrol station (Australia, Hong Kong, New Zealand, Singapore, South Africa, United Kingdom and Ireland), service station (Australia, France, Japan, New Zealand and United Kingdom), a services (United Kingdom), or servo (Australia), or fuel station (Israel). Fuel dispensers are used to pump petrol/gasoline, diesel, compressed natural gas, CGH2, HCNG, LPG, liquid hydrogen, kerosene, alcohol fuel (like methanol, ethanol, butanol, propanol), biofuels (like straight vegetable oil, biodiesel), or other types of fuel into the tanks within vehicles and calculate the financial cost of the fuel transferred to the vehicle. Fuel dispensers are also known as bowsers (in some parts of Australia), petrol pumps (in most Commonwealth countries) or gas pumps (in North America). Besides fuel dispensers, one other significant device which is also found in filling stations and can refuel certain (compressed-air) vehicles is an air compressor, although generally these are just used to inflate car tyres. Also, many filling stations incorporate a convenience store, which like most other buildings generally have electricity sockets; hence plug-in electric vehicles can be recharged. The convenience stores found in filling stations typically sell candy, soft drinks, snacks and, in some cases, a small selection of grocery items, such as milk. Some also sell propane or butane and have added shops to their primary business. Conversely, some chain stores, such as supermarkets, discount stores, warehouse clubs, or traditional convenience stores, have provided filling stations on the premises. The term "gas station" is widely used in the United States, Canada and the English-speaking Caribbean, where the fuel is known as "gasoline" or "gas" as in "gas pump". In some regions of Canada, the term gas bar is used. Elsewhere in the English-speaking world, mainly in the Commonwealth, the fuel is known as "petrol", and the term "petrol station" or "petrol pump" is used. In the United Kingdom and South Africa "garage" is still commonly used. Similarly, in Australia, the term "service station" ("servo") describes any petrol station. In Japanese English, a commonly used term is gasoline stand, although the abbreviation SS (for service station) is also used. In Indian English, it is called a petrol pump or a petrol bunk. In some regions of America and Australia, many filling stations have a mechanic on duty, but this is uncommon in other parts of the world. The UK has 8,422 petrol stations as of December 2017[update], down from about 18,000 in 1992 and a peak of around 40,000 in the mid-1960s. The USA had 114,474 filling stations (gas stations) in 2012, according to the U.S. Census Bureau, down from 118,756 in 2007 and 121,446 in 2002. In Canada, the number is on the decline. As of December 2008, 12,684 were in operation, significantly down from about 20,000 stations recorded in 1989. In Japan, the number dropped from a peak of 60,421 in 1994 to 40,357 at the end of 2009. In Germany, the number dropped down to 14,300 in 2011. In Argentina, as of 2014, there are 3,916 gas stations after a 2% decrease from the previous year. 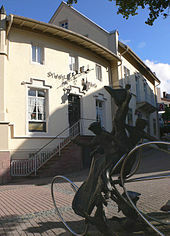 The first filling station was the city pharmacy in Wiesloch, Germany, where Bertha Benz refilled the tank of the first automobile on its maiden trip from Mannheim to Pforzheim back in 1888. Shortly thereafter other pharmacies sold gasoline as a side business. Since 2008 the Bertha Benz Memorial Route commemorates this event. The first "posto de gasolina" of South America was opened in Santos, Brazil, in 1920. It was located in the Ana Costa Ave., in front of the beach, in a corner that nowadays is located the Hotel Atlantico. It was an Esso Gas Station, brought by Antonio Duarte Moreira, a taxi entrepreneur. The increase in automobile ownership after Henry Ford started to sell automobiles that the middle class could afford resulted in an increased demand for filling stations. The world's first purpose-built gas station was constructed in St. Louis, Missouri in 1905 at 420 S. Theresa Avenue. The second gas station was constructed in 1907 by Standard Oil of California (now Chevron) in Seattle, Washington, at what is now Pier 32. Reighard's Gas Station in Altoona, Pennsylvania, claims that it dates from 1909 and is the oldest existing gas station in the United States. Early on, they were known to motorists as "filling stations". The first "drive-in" filling station, Gulf Refining Company, opened to the motoring public in Pittsburgh on December 1, 1913, at Baum Blvd & St Clair's Street (Walter's Automotive Shop was located here on the 100th anniversary). Prior to this, automobile drivers pulled into almost any general or hardware store, or even blacksmith shops in order to fill up their tanks. On its first day, the station sold 30 gallons of gasoline at 27 cents per gallon. This was also the first architect-designed station and the first to distribute free road maps. The first alternative fuel station was opened in San Diego, California, by Pearson Fuels in 2003. In Russia, the first filling stations appeared in 1911, when the Imperial Automobile Society signed an agreement with the partnership "Br. Nobel". By 1914 about 440 filling stations functioned in major cities across the country. In the mid-1960s in Moscow there were about 250 stations. A significant boost in retail network development occurred with the mass launch of the car "Zhiguli" at the Volga Automobile Plant, which was built in Tolyatti in 1970. Gasoline for other than non-private cars was sold for ration cards only. This type of payment system stopped in the midst of "Perestroika" in the early 1990s. Today, since the saturation of automobile filling stations in Russia is insufficient and lags behind the leading countries of the world, there is a need to accommodate new stations in the cities and along the roads of different levels. A Shell gas station near Lost Hills, California, U.S.
An Indian Oil filling station near Derabassi, Punjab, India. Most filling stations are built in a similar manner, with most of the fueling installation underground, pump machines in the forecourt and a point of service inside a building. Single or multiple fuel tanks are usually deployed underground. Local regulations and environmental concerns may require a different method, with some stations storing their fuel in container tanks, entrenched surface tanks or unprotected fuel tanks deployed on the surface. Fuel is usually offloaded from a tanker truck into the tanks through a separate valve, located on the filling station's perimeter. Fuel from the tanks travels to the dispenser pumps through underground pipes. For every fuel tank, direct access must be available at all times. Most tanks can be accessed through a service canal directly from the forecourt. Older stations tend to use a separate pipe for every kind of available fuel and for every dispenser. Newer stations may employ a single pipe for every dispenser. This pipe houses a number of smaller pipes for the individual fuel types. Fuel tanks, dispenser and nozzles used to fill car tanks employ vapor recovery systems, which prevents releases of vapor into the atmosphere with a system of pipes. The exhausts are placed as high as possible. A vapor recovery system may be employed at the exhaust pipe. This system collects the vapors, liquifies them and releases them back into the lowest grade fuel tank available. The forecourt is the part of a filling station where vehicles are refueled. Fuel dispensers are placed on concrete plinths, as a precautionary measure. Additional elements may be employed, including metal barriers. The area around the fuel dispensers must have a drainage system. Since fuel sometimes spills on the ground, as little of it as possible should penetrate the soil. Any liquids present on the forecourt will flow into a channel drain before it enters a petrol interceptor which is designed to capture any hydrocarbon pollutants and filter these from rainwater which may then proceed to a foul sewer, stormwater drain or to ground. If a filling station allows customers to pay at the register, the data from the dispensers may be transmitted via RS232, RS485 or Ethernet to the point of sale, usually inside the filling station's building, and fed into the station's cash register operating system. The cash register system gives a limited control over the fuel dispenser, and is usually limited to allowing the clerks to turn the pumps on and off. A separate system is used to monitor the fuel tank's status and quantities of fuel. With sensors directly in the fuel tank, the data is fed to a terminal in the back room, where it can be downloaded or printed out. Sometimes this method is bypassed, with the fuel tank data transmitted directly into an external database. The underground modular filling station is a construction model for filling stations that was developed and patented by U-Cont Oy Ltd in Finland in 1993. Afterwards the same system was used in Florida, USA. Above-ground modular filling stations were built in the 1980s in eastern Europe and especially in Soviet Union, but they were not built in other parts of Europe due to the stations' lack of safety in case of fire. The construction model for underground modular filling station makes the installation time shorter, designing easier and manufacturing less expensive. As a proof of the model's installation speed an unofficial world record of filling station installation was made by U-Cont Oy Ltd when a modular filling station was built in Helsinki, Finland in less than three days, including groundwork. The safety of modular filling stations has been tested in a filling station simulator, in Kuopio, Finland. These tests have included for instance burning cars and explosions in the station simulator. In the United States and Canada, there are generally two marketing types of filling stations: premium brands and discount brands. Filling stations with premium brands sell well-recognized and often international brands of gasoline, including Exxon and its Esso brand, Phillips 66/Conoco/76, Chevron, Mobil, Shell, Husky Energy, Sunoco (US), BP, Valero and Texaco. Non-international premium brands include Petrobras, Petro-Canada (owned by Suncor Energy Canada), QuikTrip, Hess, Sinclair, and Pemex. Premium brand stations accept credit cards, often issue their own company cards (a.k.a. fuel cards or fleet cards) and may charge higher prices. In some cases, fuel cards for customers with a lower fuel consumption are ordered not directly from an oil company, but from an intermediary. Many premium brands have fully automated pay-at-the-pump facilities. Premium gas stations tend to be highly visible from highway and freeway exits, utilizing tall signs to display their brand logos. Discount brands are often smaller, regional chains or independent stations, offering lower prices on gasoline. Most purchase wholesale commodity gasoline from independent suppliers or from the major petroleum companies. Lower-priced gas stations are also found at some supermarkets (Albertsons, Kroger, Ingles, Lowes Foods, Giant, Weis Markets, Safeway, Hy-Vee, Vons, Meijer, Loblaws/Real Canadian Superstore, and Giant Eagle), convenience stores (7-Eleven, Circle K, Cumberland Farms, Quick Chek, Road Ranger, Sheetz and Wawa), discount stores (Walmart, Canadian Tire) and warehouse clubs (Costco, Sam's Club, and BJ's Wholesale Club). At some stations (such as Vons, Costco, BJ's Wholesale Club, or Sam's Club), consumers are required to hold a special membership card in order to be eligible for the discounted price, or pay only with the chain's cash card, debt card or a credit card issuer exclusive to that chain. In some areas, such as New Jersey, this practice is illegal, and stations are required to sell to all at the same price. Some convenience stores, such as 7-Eleven and Circle K, have co-branded their stations with one of the premium brands. After the Gulf Oil company was sold to Chevron, northeastern retail units were sold off as a chain, with Cumberland Farms controlling the remaining Gulf Oil outlets in the United States. Some countries have only one brand of filling station. In Mexico, where the oil industry is state-owned and prices are regulated, the country's main operator of filling stations is Pemex. In Malaysia, Shell is the dominant player by number of stations, with government-owned Petronas coming in second. In Indonesia, the dominant player by number of stations is the government-owned Pertamina, although other companies such as Total and Shell are increasingly found in big cities such as the capital Jakarta or Surabaya. Some companies, such as Shell, use their brand worldwide, however, Chevron uses its inherited brand Caltex in Asia Pacific, Australia and Africa, and its Texaco brand in Europe and Latin America. ExxonMobil uses its Exxon and Mobil brands but is still known as Esso (the forerunner company name, Standard Oil or S. O.) in many places, most noticeably in Canada. In Brazil, the main operators are Petrobras Distribuidora and Ipiranga, but Esso and Shell are also present. In the United Kingdom, the two largest are BP and Shell. The "Big Four" supermarket chains, Morrisons, Sainsburys, Asda and Tesco, all operate filling stations, as well as some of the smaller supermarkets such as The Co-operative Group and Waitrose. Indian Oil operates approximately 15,000 filling stations in India. In Japan, the main operators are Cosmo Oil, Idemitsu, JXTG Nippon Oil & Energy (under the brand names ENEOS, Express and General) and Mitsubishi Group (operates self-service stations under the Lawson convenience store branding), although foreign brands such as Shell (Showa Shell Sekiyu), and formerly Esso and Mobil (previously operated by JXTG Nippon Oil under licence from ExxonMobil, all rebranded to ENEOS in 2019) are also present. In British Columbia and Alberta, it is a legal requirement that customers either pre-pay for the fuel or pay at the pump. The law is called "Grant's Law" and is intended to prevent "gas-and-dash" crimes, where a customer refuels and then drives away without paying for it. In other provinces, payment after filling is permitted and widely available, though some stations may require either a pre-payment or a payment at the pump during night hours. In the Republic of Ireland, most filling stations allow customers to pump fuel before paying. Some filling stations have pay-at-the-pump facilities. Most service stations allow the customer to pump the fuel before paying; this is particularly the case in the smaller towns and cities in New Zealand. In recent years, some service stations have required customers to purchase their fuel first. It is quite common for customers to hand the cash to the attendant on the forecourt if they are paying for a set amount of fuel and have no change. Some supermarkets have their own forecourts which are unmanned and payment is pay-at-pump only. Customers at the supermarket will receive a discount voucher which offers discounted fuel at their forecourt. The amount of discount varies depending on the amount spent on groceries at the supermarket, but normally starts at 4 cents a litre. A small independent filling station in Boston Spa, West Yorkshire, England. Stations like these in the United Kingdom are becoming rarer. A large majority of stations allow customers to pay with a chip and pin payment card or pay in the shop. Many have a pay at the pump system, where customers can enter their PIN prior to refuelling. Pre-payment, most commonly at the pump, is the norm in the U.S. Customers may typically pay either at the pump or inside the gas station. Modern gas stations have pay-at-the-pump functions: in most cases credit, debit, ATM cards, fuel cards and fleet cards are accepted. Occasionally a station will have a pay-at-the-pump-only period per day, when attendants are not present, often at night, and some stations are pay-at-the-pump only 24 hours a day. Filling stations typically offer one of three types of service to their customers: full service, minimum service or self-service. An attendant (gas jockey) operates the pumps, often wipes the windshield, and sometimes checks the vehicle's oil level and tire pressure, then collects payment (and perhaps a small tip). An attendant operates the pumps. This is often required due to legislation that prohibits customers from operating the pumps. The customer performs all required service. Signs informing the customer of filling procedures and cautions are displayed on each pump. Customers can still enter a store or go to a booth to give payment to a person. Using cardlock (or pay-at-the-pump) system, these are completely unstaffed. Filling station of Royal Dutch Shell in Feira de Santana, Brazil. In Brazil, self-service fuel filling is illegal, due to a federal law enacted in 2000. The law was introduced by Federal Deputy Aldo Rebelo, who claims it saved 300,000 fuel attendant jobs across the country. Before 1998, filling stations in Japan were entirely full-service stations. Self-service filling stations were legalised in Japan in 1998 following the abolishment of the Special Petroleum Law, which led to the deregulation of the petroleum industry in Japan. Under current safety regulations, while motorists are able to self-dispense fuel at self-service stations, generally identified in Japanese as serufu (セルフ), at least one fuel attendant must be on hand to keep watch over potential safety violations and to render assistance to motorists whenever necessary. The states of Oregon and New Jersey (shown in red) prohibit self-service. In the past, filling stations in the United States offered a choice between full service and self service. Before 1970, full service was the norm, and self-service was rare. Today, few stations advertise or provide full service. Full service stations are more common in wealthy and upscale areas. The cost of full service is usually assessed as a fixed amount per U.S. gallon. The first self-service station in the United States was in Los Angeles, opened in 1947 by Frank Urich. In Canada, the first self-service station opened in Winnipeg, Manitoba, in 1949. It was operated by the independent company Henderson Thriftway Petroleum, owned by Bill Henderson. All stations in New Jersey offer only full service and mini service; attendants are required to pump gas since customers are prohibited by law from pumping gas themselves. In Oregon, self-service stations may only be located in counties with a total populations of 40,000 or less, self service is still prohibited in larger counties. The only exceptions are at the filling stations next to Joint Base McGuire-Dix-Lakehurst in Wrightstown, New Jersey and next to the Indian reservation casinos in both Pendleton and Grand Ronde, Oregon where self-service is permitted at these three locations. New Jersey prohibited self-service gasoline in 1949 after lobbying by service station owners. Proponents of the prohibition cite safety and jobs as reasons to keep the ban. Likewise, the 1951 Oregon statute prohibiting self-service gasoline lists 17 different justifications, including the flammability of gas, the risk of crime from customers leaving their vehicles, the toxic fumes emitted by gasoline, and the jobs created by requiring mini service. In New Jersey and Oregon, it is legal for customers to pump their own diesel fuel. Although not every station permits diesel customers to do so; truck stops typically do. In Oregon, "certain nonretail" customers may also pump their own fuel. In addition, the ban on self-service gasoline is seen as part of Oregonian culture. One commentator noted, "The joke is when babies are born in Oregon, the doctor slaps their bottom, 'No self-serve and no sales tax'... It's as much a cultural issue as an economic issue. It's a way of life." However, recent years have shown that this opinion might be changing, as a 2014 Public Policy Poll showed that although self-serve was favored by a narrow margin of all Oregonians, Oregonians under 45 favored self-serve gas by 53 percent to 33 percent. In 1982 Oregon voters rejected a ballot measure sponsored by the service station owners, which would have legalized self-service gas. Oregon legislators passed a bill that was signed into law by the Governor in May 2017 to allow self-service for counties with a total population of 40,000 or less beginning in January 2018. The constitutionality of the self-service bans has been disputed. The Oregon statute was brought into court in 1989 by ARCO, and the New Jersey statute was challenged in court in 1950 by a small independent service station, Rein Motors. Both challenges failed. Former New Jersey governor Jon Corzine sought to lift the ban on self-service for New Jersey. He asserted that it would be able to lower gas prices, but some New Jerseyans argued that it could cause drawbacks, especially unemployment. However, Phil Murphy's plan on $15 minimum wage will increase expenses, may cause self service. The town of Huntington, New York prohibits gasoline self-service to save jobs. The ban came into effect in the early 1970s during a recession. A Spar express convenience store in a Shell filling station in Wattens, Austria. Many stations provide toilet facilities for customer use, as well as squeegees and paper towels for customers to clean their vehicle's windows. Discount stations may not provide these amenities in some countries. Stations typically have an air compressor (some with a built-in or provided handheld tire-pressure gauge) to inflate tires and a hose to add water to vehicle radiators. Some air compressor machines are free of charge, while others charge a small fee to use (typically 50 cents to a dollar in North America). In many U.S. states, state law requires that paying customers must be provided with free air compressor service. In most cases, a token provided by the attendant is used in lieu of coins. Many filling stations have integrated convenience stores which sell food, beverages, and often cigarettes, lottery tickets, motor oil, and auto parts. Prices for these items tend to be higher than they would be at a supermarket or discount store. Many stations, particularly in the United States, have a fast food outlet inside. These are usually "express" versions with limited seating and limited menus, though some may be regular-sized and have spacious seating. Larger restaurants are common at truck stops and toll road service plazas. In some U.S. states, beer, wine, and liquor are sold in gas stations, though this practice varies according to state law (see Alcohol laws of the United States by state). Nevada also allows the operation of slot and video poker machines without time restrictions. Vacuum cleaners, often coin-operated, are a common amenity to allow the cleaning of vehicle interiors, either by the customer or by an attendant. Some stations are equipped with car washes. Car washes are sometimes offered free of charge or at a discounted price with a certain amount of gas purchased. Conversely, some car washes operate filling stations to supplement their businesses. From approximately 1920 to 1980, many service stations in the US provided free road maps affiliated with their parent oil companies to customers. This practice fell out of favor due to the 1970s energy crisis. In European Union member states, petrol prices are much higher than in North America due to higher fuel excise or taxation, although the base price is also higher than in the U.S. Occasionally, price rises trigger national protests. In the UK, a large-scale protest in August and September 2000, known as 'The Fuel Crisis', caused wide-scale havoc not only across the UK, but also in some other EU countries. The UK Government eventually backed down by indefinitely postponing a planned increase in fuel duty. This was partially reversed during December 2006 when then-Chancellor of the Exchequer Gordon Brown raised fuel duty by 1.25 pence per litre. Since 2007, petrol prices in the UK rose by nearly 40 pence per litre, going from 97.3 pence per litre in 2007 to 136.8 pence per litre in 2012. In much of Europe, including the UK, France and Germany, filling stations operated by large supermarket chains usually price fuel lower than stand-alone filling stations. In most of mainland Europe, sales tax is lower on diesel fuel than on petrol, and diesel is accordingly the cheaper fuel: in the UK and Switzerland, diesel has no tax advantage and retails at a higher price by quantity than petrol (offset by its higher energy yield). In 2014, according to Eurostat, the mean EU28 price was 1.38 €/L for euro-super 95 (gazoline), 1.26 €/L for gazole (for diesel car). The less expensive gasoline is in Estonia at 1.10 €/L, and the most expensive at 1.57 €/L in Italy. The less expensive gasoil (diesel) is in Estonia at 1.14 €/L, and the most expensive at 1.54 €/L in the UK. The less expensive GPL is in Belgium at 0.50 €/L, and the most expensive at 0.83 €/L in France. Nearly all filling stations in North America advertise their prices on large signs outside the stations. Some locations have laws requiring such signage. In Canada and the United States, federal, state or provincial, and local sales taxes are usually included in the price, although tax details are often posted at the pump and some stations may provide details on sales receipts. Gas taxes are often ring-fenced (dedicated) to fund transportation projects such as the maintenance of existing roads and the construction of new ones. In the United States, the states of California and Hawaii typically have the highest gasoline prices, while the lowest prices are usually found in oil-producing states like Oklahoma and Texas. In Canada, prices are typically highest in the provinces of British Columbia and Quebec, and the lowest in the oil-producing province of Alberta. The provinces of Prince Edward Island (PEI), Newfoundland and Labrador, New Brunswick, and Nova Scotia have instituted gasoline price regulation, which is intended to protect small rural gas stations from low profits due to low sales volume. Individual gas stations in the United States have little if any control over gasoline prices. The wholesale price of gasoline is determined according to area by oil companies which supply the gasoline, and their prices are largely determined by the world markets for oil. Individual gas stations are unlikely to sell gasoline at a loss, and the profit margin—typically between 7 and 11 cents a U.S. gallon—that they make from gasoline sales is limited by competitive pressures: a gas station which charges more than others will lose customers to them. Most gas stations try to compensate by selling higher-margin food products in their convenience stores. Even with oil market fluctuations, prices for gasoline in the United States are among the lowest in the industrialized world; this is principally due to lower taxes. While the sales price of gasoline in Europe is more than twice that in the United States, the price of gas excluding taxes is nearly identical in the two areas. Some Canadians and Mexicans in communities close to the U.S. border drive into the United States to purchase cheaper gasoline. Due to heavy fluctuations of gasoline price in the United States, some gas stations offer their customers the option to buy and store gas for future uses, such as the service provided by First Fuel Bank. engaging in misleading or deceptive practices. Gas stations must never hold discussions with other competitors regarding pricing policies and methods, terms of sale, costs, allocation of markets or boycotts of our petroleum products. Like many gasoline stands in Japan, this Shell filling station has hoses that hang from above. In other energy-importing countries such as Japan, gasoline and petroleum product prices are higher than in the United States because of fuel transportation costs and taxes. On the other hand, some of the major oil-producing countries such as the Gulf States, Iran, Iraq, and Venezuela provide subsidized fuel at well-below world market prices. This practice tends to encourage heavy consumption. Hong Kong has some of the highest pump prices in the world, but most customers are given discounts as card members. In Western Australia a programme called FuelWatch requires most WA filling stations to notify their "tomorrow prices" by 2 pm each day; prices are changed at 6 am each morning, and must be held for 24 hours. Each afternoon, the prices for the next day are released to the public and the media, allowing consumers to decide when to fill up. A service station or "servo" is the terminology predominantly used in Australia and New Zealand. In Australia, a "servo" is commonly used to describe any facility where motorists can refuel their cars. In New Zealand a filling station is often referred to as a service station, garage, or petrol station, even though the filling station may not offer mechanical repairs or assistance with dispensing fuel. Levels of service available include full service, for which assistance in dispensing fuel is offered, as well as offers to check tyre pressure or clean vehicle windscreens. This type of service is becoming uncommon in New Zealand, particularly Auckland. Further south of Auckland, many filling stations offer full service. There is also help service or assisted service, for which customers must request assistance before it is given, and self-service, for which no assistance is available. In the U.S., a filling station that also offers services such as oil changes and mechanical repairs to automobiles is called a service station. Until the 1970s the vast majority of gas stations were service stations; now only a minority are. These stations typically offered free air for inflating tires, as compressed air was already on hand to operate the repair garage's pneumatic tools. This kind of business provided the name for the U.S. comic strip Gasoline Alley, where a number of the characters worked. In the UK, a 'service station' refers to much larger facilities, usually attached to motorways (see rest area) or major truck routes, which provide food outlets, large parking areas, and often other services such as hotels, arcade games, and shops in addition to 24-hour fuel supplies and a higher standard of restrooms. Fuel is typically more expensive from these outlets due to their premium locations. UK service stations do not usually repair automobiles. This arrangement occurs on many toll roads and some interstate freeways and is called an oasis or service plaza. In many cases, these centres might have a food court or restaurants. In the United Kingdom these are called Motorway service areas. Often, the state government maintains public rest areas directly connected to freeways, but does not rent out space to private businesses, as this is specifically prohibited by law via the Interstate Highway Act of 1956 which created the national Interstate Highway System, except sites on freeways built before January 1, 1960, and toll highways that are self-supporting but have Interstate designation, under a grandfather clause. As a result, such areas often provide only minimal services such as restrooms and vending machines. Private entrepreneurs develop additional facilities, such as truck stops or travel centers, restaurants, gas stations, and motels in clusters on private land adjacent to major interchanges. In the U.S., Pilot Flying J and TravelCenters of America are two of the most common full-service chains of truck stops. Because these facilities are not directly connected to the freeway, they usually have huge signs on poles high enough to be visible by motorists in time to exit from the freeway. Sometimes, the state also posts small official signs (normally blue) indicating what types of gas stations, restaurants, and hotels are available at an upcoming exit; businesses may add their logos to these signs for a fee. In Canada, the province of Ontario has stops along two of its 400-series highways, the 401 and the 400, traditionally referred to as "Service Centres", but recently renamed "ONroute" as part of a full rebuild of the sites. Owned by the provincial government, but leased to private operator Host Kilmer Service Centres, they contain food courts, convenience stores, washrooms, and co-located gas and diesel bars with attached convenience stores. Food providers include Tim Hortons (at all sites), A&W, Wendy's and Pizza Pizza. At most sites fuel is sold by Canadian Tire, with a few older Esso gas bars at earlier renovated locations. In Australia, gasoline is unleaded, and available in 91, 95, 98 and 100 octane (names of various petrols differ from brand to brand). Fuel additives for use in cars designed for leaded fuel are available at most filling stations. In Canada, the most commonly found octane grades are 87 (regular), 89 (mid grade) and 91 (premium), using the same "(R+M)/2 Method" used in the U.S. (see below). In China, the most commonly found octane grade is RON 91 (regular), 93 (mid grade) and 97 (premium). Almost all of the fuel has been unleaded since 2000. In some premium gas stations in large cities, such as Petrol China and SinoPec, RON 98 gas is sold for racing cars. In Europe, gasoline is unleaded and available in 95 RON (Eurosuper) and, in nearly all countries, 98 RON (Super Plus) octanes; in some countries 91 RON octane gasoline is offered as well. In addition, 100 RON petrol is offered in some countries in continental Europe (Shell markets this as V-Power Racing). Some stations offer 98 RON with lead substitute (often called "Lead-Replacement Petrol, or LRP). In New Zealand, gasoline is unleaded, and most commonly available in 91 RON ("Regular") and 95 RON ("Premium"). 98 RON is available at selected BP ("Ultimate") and Mobil ("Synergy 8000") service stations instead of the standard 95 RON. 96 RON was replaced by 95 RON, and subsequently abolished in 2006. Leaded fuel was abolished in 1996. In the UK the most common gasoline grade (and lowest octane generally available) is 'Premium' 95 RON unleaded. 'Super' is widely available at 97 RON (for example Shell V-Power, BP Ultimate). Leaded fuel is no longer available. In the United States all motor vehicle gasoline is unleaded and is available in several grades with different octane rating; 87 (Regular), 89 (Mid-Grade), and 93 (Premium) are typical grades. The maximum octane rating in California is generally 91. At high altitudes in the Mountain States and the Black Hills of South Dakota, regular unleaded can be as low as 85 octane; this practice is now increasingly controversial, since it was instituted when most cars had carburetors instead of the fuel injection and electronic engine controls standard in recent decades. In the U.S. gasoline is described in terms of its "pump octane", which is the mean of their "RON" (Research Octane Number) and "MON" (Motor Octane Number). Labels on gasoline pumps in the U.S. typically describe this as the "(R+M)/2 Method". Some nations describe fuels according to the traditional RON or MON ratings, so octane ratings cannot always be compared with the equivalent U.S. rating by the "(R+M)/2 method". In Europe and Australia, the customer selects one of several color-coded nozzles depending on the type of fuel required. The filler pipe of unleaded fuel is smaller than the one for fuels for engines designed to take leaded fuel. The tank filler opening has a corresponding diameter; this prevents inadvertently using leaded fuel in an engine not designed for it, which can damage a catalytic converter. In most stations in Canada and the US, the pump has a single nozzle and the customer selects the desired octane grade by pushing a button. Some pumps require the customer to pick up the nozzle first, then lift a lever underneath it; others are designed so that lifting the nozzle automatically releases a switch. Some newer stations have separate nozzles for different types of fuel. Where diesel fuel is provided, it is usually dispensed from a separate nozzle even if the various grades of gasoline share the same nozzle. Motorists occasionally pump gasoline into a diesel car by accident. The converse is almost impossible because diesel pumps have a large nozzle with a diameter of 15⁄16 inch (23.8 mm) which does not fit the 13⁄16-inch (20.6 mm) filler, and the nozzles are protected by a lock mechanism or a liftable flap. Diesel fuel in a gasoline engine — while creating large amounts of smoke — does not normally cause permanent damage if it is drained once the mistake is realized. However even a liter of petrol added to the tank of a modern diesel car can cause irreversible damage to the injection pump and other components through a lack of lubrication. In some cases, the car has to be scrapped because the cost of repairs exceeds its residual value. The issue is not clear-cut as older diesels using completely mechanical injection can tolerate some gasoline — which has historically been used to "thin" diesel fuel in winter. In most countries, petrol stations are subjected to guidelines and regulations which exist to minimise the potential of fires, and increase safety. It is prohibited to use open flames and, in some places, mobile phones on the forecourt of a filling station because of the risk of igniting gasoline vapor. In the U.S. the fire marshal is responsible for regulations at the gas pump. Most localities ban smoking, open flames and running engines. Since the increased occurrence of static-related fires many stations have warnings about leaving the refueling point. Cars can build up static charge by driving on dry road surfaces. However many tire compounds contain enough carbon black to provide an electrical ground which prevents charge build-up. Newer "high mileage" tires use more silica and can increase the buildup of static. A driver who does not discharge static by contacting a conductive part of the car will carry it to the insulated handle of the nozzle and the static potential will eventually be discharged when this purposely-grounded arrangement is put into contact with the metallic filler neck of the vehicle. Ordinarily, vapor concentrations in the area of this filling operation are below the lower explosive limit (LEL) of the product being dispensed, so the static discharge causes no problem. The problem with ungrounded gas cans results from a combination of vehicular static charge, the potential between the container and the vehicle, and the loose fit between the grounded nozzle and the gas can. This last condition causes a rich vapor concentration in the ullage (the unfilled volume) of the gas can, and a discharge from the can to the grounded hanging hardware (the nozzle, hose, swivels and break-a-ways) can thus occur at a most inopportune point. The Petroleum Equipment Institute has recorded incidents of static-related ignition at refueling sites since early 2000. Although urban legends persist that a mobile phone can cause sparks, this has not been duplicated under any controlled condition. Nevertheless, mobile phone manufacturers and gas stations ask users to switch off their phones. One suggested origin of this myth is said to have been started by gas station companies because the cell phone signal would interfere with the fuel counter on some older model fuel pumps causing it to give a lower reading. In the MythBusters episode "Cell Phone Destruction", investigators concluded that explosions attributed to cell phones could be caused by static discharges from clothing instead and also observed that such incidents seem to involve women more often than men. The U.S. National Fire Protection Association does most of the research and code writing to address the potential for explosions of gasoline vapor. The customer fueling area, up to 18 inches (46 cm) above the surface, normally does not have explosive concentrations of vapors, but may from time to time. Above this height, where most fuel filler necks are located, there is no expectation of an explosive concentration of gasoline vapor in normal operating conditions. Electrical equipment in the fueling area may be specially certified for use around gasoline vapors. ^ "Video reference: 0:09-0:15 "Before you feel too tired, pull off into a Services or other safe area."". United Kingdom road safety THINK program. Archived from the original on 2014-07-01. Retrieved 2014-05-16. ^ Mark Gwynn (October 2005). "When people become words" (PDF). Ozwords. Australian National Dictionary Centre. Archived (PDF) from the original on 2009-03-20. But one doesn't have to be an Australian to enter the Australian lexicon — take bowser 'petrol pump' (in Australia), which is named after a company established by US inventor and entrepreneur S.F. Bowser (died 1938). ^ "UKPIA Statistical Review 2018" (PDF). UKPIA. Retrieved 2019-03-09. ^ "UKPIA – Refining Britain's Fuels – Industry Overview". Archived from the original on 30 May 2015. Retrieved 10 June 2015. ^ Bureau, U.S. Census. "American FactFinder – Results". Retrieved 2 December 2016. ^ ADAC. "Anzahl an Tankstellen und Markenverteilung". Archived from the original on 8 April 2015. Retrieved 10 June 2015. ^ "2009年中国加油站行业研究报告－交通运输其它－中国市场情报中心". Archived from the original on 11 June 2015. Retrieved 10 June 2015. ^ "NOT FOUND". Archived from the original on 22 July 2012. Retrieved 2 December 2016. ^ "Combustible local: ¿cuántas estaciones de servicio hay en la Argentina?". Archived from the original on 3 December 2016. Retrieved 2 December 2016. ^ "Orlen w pierwszej dziesiątce w Europie". ^ "Bertha Benz Memorial Route". Archived from the original on 23 September 2015. Retrieved 10 June 2015. ^ "Desde que gasolina era com 'z'". 2016-08-16. ^ "America's Oldest Gasoline Station". Archived from the original on 5 June 2015. Retrieved 10 June 2015. ^ "The History of Gasoline Retailing - NACS Online – Your Business – NACS Retail Fuels Reports – 2011 NACS Retail Fuels Report". Archived from the original on 11 June 2015. Retrieved 10 June 2015. ^ "E85 Station Opens in Concord, California". Energy. 2008-08-06. Archived from the original on 28 November 2014. Retrieved 10 June 2015. ^ "The history of filling stations in Russia". Archived from the original on 2017-02-04. ^ "B.C. to implement 'Grant's Law' to protect gas station workers". CBC News. 2006-10-04. Archived from the original on May 30, 2009. ^ "Husky Cardlocks – MyHusky.ca". Archived from the original on 23 May 2013. Retrieved 10 June 2015. ^ Aldo Rebelo (2015-02-23). "Ministro Aldo Rebelo comenta artigo sobre baixo crescimento". Folha de S.Paulo. Archived from the original on 2015-02-26. ^ "Gas Stations in Japan - How to fill up". realestate-tokyo.com. ^ Hamaker, Sarah (October 2011). "Self-Serve Evolution". The Association for Convenience & Fuel Retailing. Archived from the original on 2015-03-11. ^ Comments, Posted: 08/22/2008 3:35 AM &#124 (2008-08-22). "P is for Pump". Winnipeg Free Press. Archived from the original on 2012-10-01. Retrieved 2010-01-19. ^ a b "Many central Oregon gas stations to pass on self-service". Associated Press. 30 December 2017. Archived from the original on 31 December 2017. Retrieved 2 January 2018. ^ Genovese, Peter (2004). "Full-service gas stations". In Lurie, Maxine N.; Mappen, Marc. Encyclopedia of New Jersey. Piscataway, New Jersey: Rutgers University Press. p. 295. ISBN 978-0-8135-3325-4. .
^ ORS 480.315. "Chapter 480". Oregon Revised Statutes, 2007 edition. Legislative Counsel Committee of the Oregon Legislative Assembly. Retrieved 2008-06-24. ^ ORS 480.345. "Chapter 480". Oregon Revised Statutes, 2017 edition. Legislative Counsel Committee of the Oregon Legislative Assembly. ^ Chen, David W. (April 28, 2006). "New Jersey May Drop Ban on Self-Service Gas Stations". New York Times. Archived from the original on December 11, 2008. Retrieved 2008-06-24. ^ Jeff Mapes. "Younger Oregon Voters Strongly Favor Self-Service Gas Pumps". Archived from the original on 2015-05-18. Retrieved 2015-05-20. ^ Ballot Measure 4 of 1982 was titled "Permits Self-Service Dispensing of Motor Vehicle Fuel at Retail" and failed with 440,824 votes in favor and 597,970 against. "Initiative, Referendum and Recall: 1980–1987" (PDF). Oregon Blue Book. 2008. Retrieved 2008-06-24. ^ Patton, Phil (2006-11-12). "When Maps Reflected Romance of the Road". The New York Times. ^ "Maps by the Decade". Road Map Collectors Association. Archived from the original on 2013-01-02. Retrieved 2013-01-02. ^ "Cars and Garages: Diagnose Problems, Estimate Costs & Find Garages". Archived from the original on 11 June 2015. Retrieved 10 June 2015. ^ a b c d "File:Consumer prices of petroleum products, end of second half 2014 (EUR per litre) YB15-fr.png - Statistics Explained". ^ Belson, Ken (2008-07-15). "A Shortage at the Pump: Not of Gas, but of 4s". The New York Times. Archived from the original on 2009-04-17. Retrieved 2008-07-15. ^ Competition Bureau Canada. "Home". Archived from the original on 9 June 2015. Retrieved 10 June 2015. ^ Phelan, Mark (May 29, 2013). "Vacationers, beware: Bad gas can damage your car". Detroit Free Press. USA Today. Archived from the original on November 20, 2016. Retrieved September 30, 2013. ^ "Petrol Stations – Health and Safety Authority". Archived from the original on 3 December 2016. Retrieved 2 December 2016. ^ "If you are an operator of or an employee at a petrol filling station – Petrol: Fire and Explosion". Archived from the original on 19 November 2016. Retrieved 2 December 2016. ^ Spencer Kelly (2004-11-05). "Mobile phones as fire risks". Click (TV series). BBC News Online. Archived from the original on 2009-02-08. Retrieved 2010-08-22. ^ "CarCare – Auto Clinic" Archived 2017-02-15 at the Wayback Machine Popular Mechanics, April 2003, p. 163. John A. Jakle, Keith A. Sculle. The Gas Station in America (Creating the North American Landscape). Baltimore, Maryland: The Johns Hopkins University Press. 1994. ISBN 0-8018-4723-0. Daniel I. Vieyra. "Fill 'Er Up": An Architectural History of America's Gas Stations. New York: Macmillan Publishing Co., 1979. ISBN 0-02-622000-8. David Freund (2017): Gas stop. The Gas Station in American Life and Landscape, 1978–1981. Steidl, ISBN 978-3958291737. 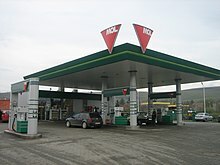 Wikimedia Commons has media related to Filling station. Look up filling station in Wiktionary, the free dictionary. ^ Grayscale photos taken 1978-1982, Recension here Archived 2018-01-29 at the Wayback Machine.